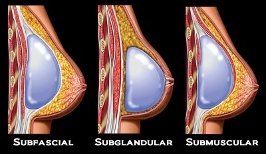 In order to understand why this technique is superior in the selected patient, we must first introduce the anatomy (see Figure 1). Every muscle is encased in a thin, but durable, layer of connective tissue – and the pectoralis major muscle is no exception. This 1mm – 2mm layer of tissue, known as fascia, has extremely high tensile strength. This is why muscles develop in a predictable form, regardless of whether they grow or shrink. Dr. Layke and Dr. Danielpour are two highly trained surgeons with training from New York, Chicago, and Miami offer you a boutique plastic surgery practice with an emphasis on personalized and individualized care. Both surgeons evaluate and operate on each individual patient, offering a comprehensive and complete approach. Drs.Layke and Danielpour believe in "Care without compromise," and will go to any length to assure patient safety and satisfaction. Thank you for rejuvenating me after the lowest and hardest point in my life ( my struggle with cancer). You guys are truly angels from above. God Bless you both!! Many heads turned at the gym yesterday as i ran on the tread mill. My size medium under shirt accentuates my new form. It felt good that attractive guys and girls our age and younger were noticing me. You're the best!